Tulsa Bone & Joint Associates offers a comprehensive range of physical therapy (PT) modalities and various therapeutic exercises to restore the highest level of function achievable in a patient after injury or surgery. Additionally, physical therapy can be utilized for preventative care. Our skilled PTs treat musculoskeletal conditions and chronic pain to find solutions that last. PT can be a positive outlet for pain relief. 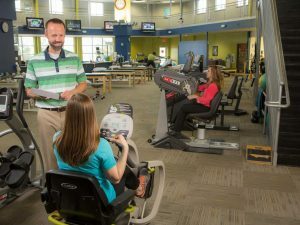 With a newly renovated, expansive, state-of-the-art facility and physical therapists trained to evaluate and develop a treatment plan specific to your needs, our PT team offers the latest innovations designed to shorten your healing time, decrease your pain, and provide the best possible outcome. Tulsa Bone & Joint (TBJ) provides physical therapy on-site, enabling you to have ongoing, immediate, and direct access to your physician and staff. Our therapists seek direct counsel from and report your progress to your physician. Your progress is communicated not by fax or by letter, but through face-to-face discussion with your physician. More efficient communication leads to improved care and outcomes. You enjoy a personalized therapy program tailored specifically to your needs. What kind of therapy do we provide? Total joint pre- and post-operative rehabilitation is achieved through a wide range of treatments at Tulsa Bone & Joint. All total joint post-surgical treatments are offered in an expansive and state-of-the-art facility for shoulder, hip, knee, or ankle. 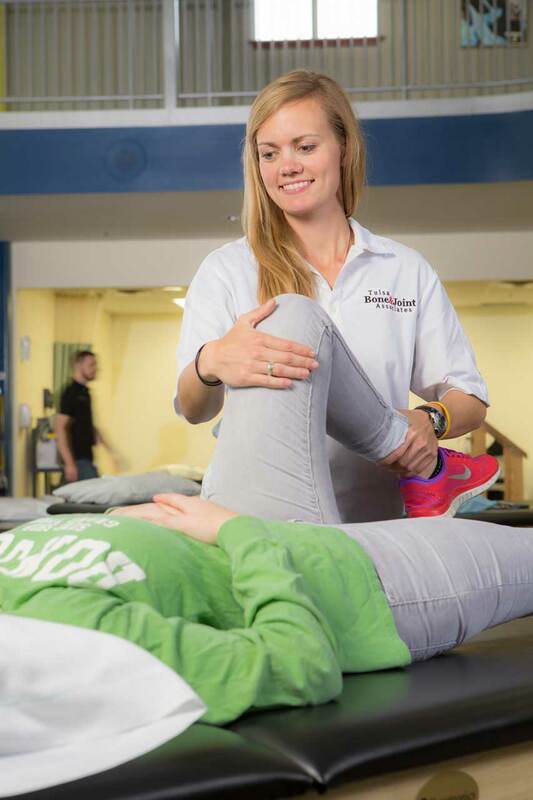 Our occupational therapists specialize in the treatment and rehabilitation of injured upper extremities and may use functional purposeful activities to address or treat the underlying dysfunction. Like physical therapy, the goal of occupational therapy is to restore normal functional use in your daily life. Our occupational therapists are also well trained in hand therapy. Sportsmetrics™ACL Injury Prevention is the first ACL injury prevention program scientifically proven to decrease serious knee ligament injuries in female athletes. ACL injury rates are 2-10 times higher in female athletes than in male athletes. Despite advances in ACL reconstruction and rehabilitation, some recent studies have reported high failure rates when patients resume sports after surgery. Sportsmetrics™ is a training program for injury prevention and performance enhancement. Jumping drills are used to teach you to pre-position the entire body safely when accelerating (jumping) or decelerating (landing). You may decrease the likelihood of an injury and maximize your athletic performance. Vestibular disorders often cause vertigo, dizziness, visual disturbance, and/or imbalance problems. Other problems can also arise that are secondary to vestibular disorders, such as nausea and/or vomiting, reduced ability to focus or concentrate, and fatigue. Vestibular rehabilitation therapy (VRT) is a customized exercise-based program primarily designed to reduce vertigo and dizziness, gaze instability, and/or imbalance and falls. Beginning with a comprehensive clinical assessment of your symptoms and how these symptoms affect your daily activities, your physician and therapist will document the type and intensity of symptoms and discuss possible triggers. Take your rehab and physical recovery to the next level. Athletes, runners, and rehab patients alike may recover, continue to train, and strengthen – while minimizing stress and potential injuries. You can recover effectively and with less pain after training or competition. The AlterG Anti-Gravity Treadmill elevates rehabilitation and athletic training with exclusive unweighting technology. You can reduce gravity’s impact by progressing between 20% and 100% of your body weight in 1% increments. Thanks to its precise technology, the AlterG Anti-Gravity Treadmill allows you to push your physical therapy rehabilitation and training further than ever before. Whether you are a patient or an athlete dealing with lower body injuries, chronic pain, or neurological conditions that inhibit mobility, you can benefit from the AlterG. Generally, chronic soft tissue problems (muscles, tendons, and ligaments) are due to scarring or degeneration. Our Astym® therapy promotes the regeneration of healthy soft tissues and eliminates or reduces unwanted scar tissue that may be causing pain or restricted movement. For the management of headache, cervical, thoracic, and upper extremity pain, dry needling involves inserting a small needle or needles (similar to acupuncture) into targeted tendons, ligaments, bones, or their connective tissues. This technique is used to improve microcirculation and decrease chronic pain conditions such as carpal tunnel syndrome. What Can Physical Therapy Do for Your Back and Neck Pain? The physical therapists at Tulsa Bone & Joint Associates have advanced education and training for many common and not-so-common orthopedic conditions. Request an appointment online or call (918) 392-1400 today to schedule your appointment in our Tulsa, Bartlesville, Owasso, or Sand Springs, Oklahoma locations.